Mike and Fritz proclaim "It's Jager Time at the Lake Delta Yacht Club on October 2nd." Tom and Fritz are shown here during FPB's evening gig at the Lake Delta Yacht Club in Rome, NY on October 2, 2010. 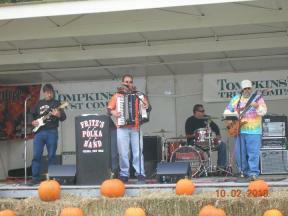 Fritz's Polka Band is shown here with some friends during FPB's evening gig on October 2nd in Rome, NY. Fritz's Polka Band wraps up their cranking gig at the Cortland Pumpkin Festival during the afternoon of October 2, 2010. (Yes, that's Frank standing on Mike's bass drum!) 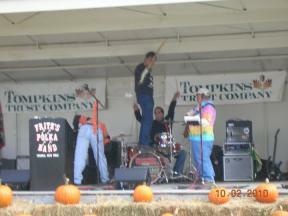 Frank, Fritz, Mike, and Gabe are shown here during FPB's afternoon gig in Cortland, NY on October 2nd. Gabe is all smiles during FPB's gig at the Cortland Pumpkin Festival during the afternoon of October 2, 2010. Frank and Fritz get out on the dance floor during FPB's cranking gig at the Bear Mountain Oktoberfest on September 26th in Bear Mountain, NY. Gabe is pictured here during FPB's gig on September 26, 2010 in Bear Mountain, NY. A standing room only crowd watched Fritz's Polka Band perform at the Bear Mountain Oktoberfest on September 26th. Frank is happy to model the 2010 Hague Oktoberfest longsleeve with some of his new friends after FPB's gig in Hague, NY on September 25th. Members of FPB share a Jagermeister toast with some new FPB fans in Hague, NY after FPB's gig at the Hague Oktoberfest on September 25, 2010. Mike admires Sierra's Metallica logo tat during the Hague Oktoberfest on September 25th. Tom and Frank are pictured here during the Hague Oktoberfest on September 25, 2010. Gabe and his Parker six string on September 25th in Hague, NY. Fritz's Polka Band strikes a pose during their gig at the Hague Oktoberfest on September 25, 2010 in Hague, NY.